Illustrated INTRODUCING guide to the pre-eminent philosopher of the Enlightenment. Immanuel Kant laid the foundations of modern Western thought. Every subsequent major philosopher owes a profound debt to Kant?s attempts to delimit human reason as an appropriate object of philosophical enquiry. And yet, Kant's relentless systematic formalism made him a controversial figure in the history of the philosophy that he helped to shape. Introducing Kant focuses on the three critiques of Pure Reason, Practical Reason and Judgement. It describes Kant's main formal concepts: the relation of mind to sensory experience, the question of freedom and the law and, above all, the revaluation of metaphysics. Kant emerges as a diehard rationalist yet also a Romantic, deeply committed to the power of the sublime to transform experience. The book explores the paradoxical nature of his ideas and explains the reasons for his undiminished importance in contemporary philosophical debates. Christopher Kul-Want is Course Director of the MA in Fine Art at Byam Shaw School of Art, London. Andrzej Klimowski is a well-known graphic designer, illustrator and author of graphic novels. Introductions aren't really supposed to be dense...so it's hard to give this one 5 stars for that very reason. This is not a breezy intro, nor is it always terribly distinct, but then Kant's problems themselves are notoriously dense, difficult and yet, for all that, central to continental philosophy. The Conclusion section is a treat for anyone enamored of the continental tradition and key modern (Hegel, Marx, Nietzsche, Heidegger) and post-modern philosophy (Foucault, Derrida, Lyotard) that follows in that tradition and attempts to grapple with Kant's enduring questions about the limits of the subject (individual), the public versus the private space of action, the nature of the aesthetic experience, the sublime, and the question of freedom. The conclusion's postmodern influence list probably should include Baudrillard, and yet he seems to be conspicuously absent, even though B was clearly engaged with the very Kantian-originated origins of philosophical concepts of the limits of knowledge, the grounds of alienation within those limits, and the nature of representation which Schopenhauer and of course Derrida later pick up on. In sum, the book seemed to me to suffer a slight bit from a lack of clarity in exposition of Kant's problematic ideas, but arguably makes up for it in the conclusion section in the way it ties the continental tradition together as Kant's lineage, and as an ultimately enlightenment-centered (if not defined) project, trying to understand itself and how it got there, whether or not there is freedom, and how to handle that freedom, if it indeed does exist. This book does NOT explain Kant, it actually makes him more incomprehensible. I'm not any kind of Kant expert, but I do know something about Kant's Critique of Judgement, and I know for a fact that the author makes Kant's ideas on the sublime more confusing and incomprehensible. Stay away, and don't waste your money. The bad reviews of this book are unfortunate, but perhaps somewhat understandable as it is clearly an unorthodox reading of Kant, where one would expect the orthodox, traditional reading for an introductory text. However, I happen to find the writer's approach very refreshing, as the traditionalist readings of Kant tend to fail to convey contemporary relevance and thus fail to excite the reader about philosophical thinking. This reading brings to life Kant's continuing relevance to philosophy across the board, but especially to the Continental, phenomenological, existential, deconstructive, etc. strands of thought. If you are familiar at all with Hegel, Nietzsche, Heidegger, Derrida, etc. and their reading of the history of Western metaphysics as a struggle with the concept of 'presence' -- a problem the Anglo-American Analytic tradition tends to misunderstand in their criticisms of phenomenological 'irrationalism' -- then you will find this book a redemption of 'boring old Kant', revealed here as the first thinker to address the problem of the concept of presence (and meaning) in a contemporary way. In this way the book is particularly revealing of the problematic many Continental thinkers have been dealing with (in their admittedly obscure languages) in light of their famous forebear. In another review here by Mr. Joshua Malle, he recognizes and seems to personally appreciate the reading of Kant given in this book, but worries perhaps that it will be too difficult to comprehend for the poor, uninitiated masses who should get something more leveled down. Well, there really are plenty of other introductory titles that give the text-book introduction to Kant. I personally encountered this book before I had a broad grasp of the Continental tradition in general and I found that this book made me interested in Kant, and inspired me to read the other, traditional approaches to him as well. It is often noted that Kant's 3rd Critique -- the Critique of Judgment -- can be read in either a conservative or radical manner for ultimate, metaphysical implications. The latter reading, which appreciates the affirmation of aesthetics, can be understood as the birthplace of what we now call the Continental tradition in philosophy. "Introducing Kant" by Want exemplifies the Continental tradition's reading of Kant as affirming the irreducibly aesthetic character of philosophical practice in the 3rd Critique. Clarifies complicated concepts simply and directly, but the book still has depth, and solid scholarly information. 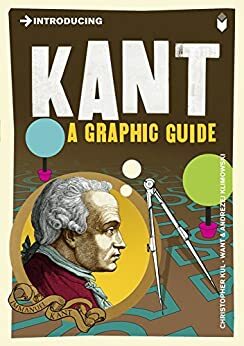 Fun approach and guide for students or anyone new to the ideas of Kant and his time.